Aack, so I forgot to update on friday again! I was so busy running errands, gazing at my newly acquired blood oranges, shopping for new 10 sided dice, gazing again at the blood oranges, that I completely forgot! 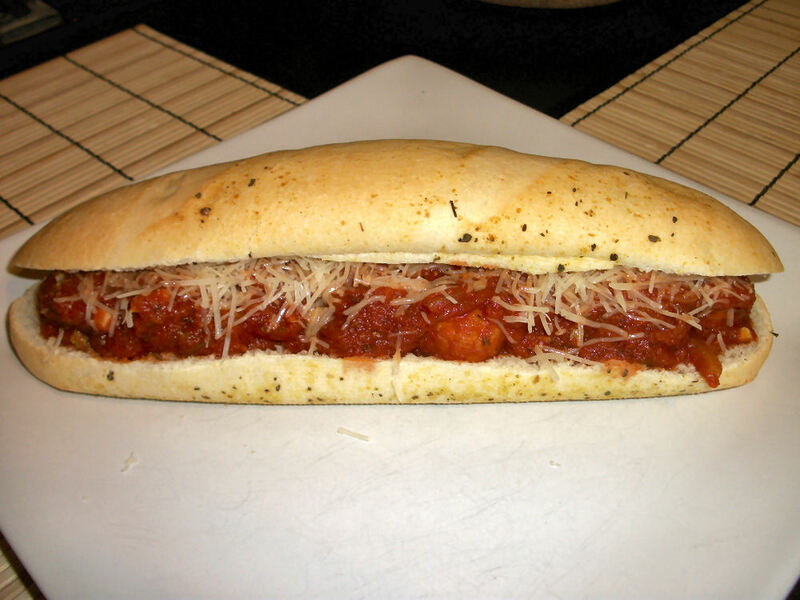 Maybe a meatball sub will make it better? Oh I think so. Always a big old mess to eat but such a happy mess really. In this recipe I was going for a quick fix so I used store bought turkey meatballs. If you want to make your own turkey meatballs I would make them the same way I made my thintastic thai meatballs just use turkey meat, and skip the hoisin sauce in the mix. This was such a tasty indulgence…and without consequence. Sweet! Saute the onion and garlic in a pan until golden. Add to crockpot. Add the meatballs, tomato sauce, oregano leaves, and italian spice to the crockpot. Cook on low for 6 hours. Serve 8 meatballs on each bun with a bit of sauce, top with 3 tbl of cheese. Enjoy! Serve 2 hungry hobbits. I did not include the bun in the nutritional value since there is so much variation in what you can choose. I suggest a nice high fibre bun. I’m lucky to have a store local to me that makes a good fibre bun that pretends to be white bread. Tastes just like subway…or maybe even better! Each serving contains 217 calories, 7 grams of fat and 6 grams of fibre. You will have leftover tomato sauce from this. I suggest saving it for a pasta night. Delicious!!! Don’t have a crockpot? No sweat, you can do this stove top same way except you should leave it simmering for 30 minutes. This entry was posted in Comfort Foods, Craving Buster, Crockpot Creations, Dinner and tagged Cheese, craving, Garlic, Onion, Tomato, turkey. Bookmark the permalink.